The Portuguese Historical Museum opened on June 7, 1997, just a few days before Portugal Day, which is commemorated on June 10 annually. The museum is one of the major attractions of History San José. 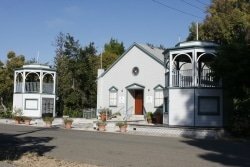 In keeping with the theme of the historical park, it depicts life as it was in the Santa Clara Valley (now known as Silicon Valley) at the turn of the 20th century. The Portuguese Historical Museum is a replica of the first permanent império (Chapel to the Holy Spirit) built in San José circa 1915. It was constructed on the present site of the I.E.S. Hall on East Santa Clara Street and U.S. 101. The império, like many of its counterparts in the Azores, was built to honor the Holy Spirit. It also served as the center of much social and religious activity. At the turn of the century, it represented the continuation of celebrated traditions that helped make easier the immigrants’ transition from the old world to the new by maintaining strong bonds to their heritage. The museum has approximately 3200 square feet of exhibit space on two levels. On the ground floor, the emphasis is on the reconstructed altar that serves as the backdrop for the explanation of the significance of the Holy Ghost celebrations. 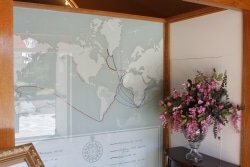 Another major showpiece is an etched glass map depicting the Portuguese world. This beautiful piece graces the entrance of the museum, and with its view, visitors are introduced to Portuguese history and culture. 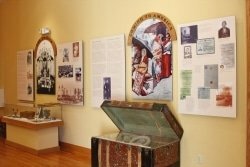 Display cases house the ever-changing exhibits on topics such as Life in The Old Country, Coming to America, and Making a Living. The lower floor hosts rotating exhibits that relive historical events like the 1957 volcanic eruption off the Azorean island of Faial and the exodus of refugees that it spawned. In addition, exhibits such as folklore and Portuguese marching bands show how these traditions continue to be a part of Portuguese-American culture. 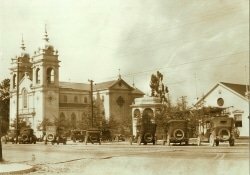 The Portuguese story in California and the Santa Clara Valley will focus on important cultural and historical events, such as the Portuguese in the Gold Rush, the Portuguese in the California whaling industry, the Portuguese in California agriculture, and the Portuguese in the construction trades. Other stories will include the building of the Five Wounds Portuguese National Church, the Holy Ghost festas, the benevolent societies, and the individual stories of everyday Portuguese immigrants. The museum will be one of constantly changing exhibits. The permanent collection will be frequently augmented by other temporary displays from other parts of California, the United States, and even from Portugal. The goal is to make the museum a constant venue of entertainment and education about Portuguese culture and history. A theater in the basement reintroduces past exhibits that have been stored for lack of space to display in the museum. Digitizing these exhibits began in late 2018 and, once completed, they will be available to museum visitors in the theater and also to virtual visitors on the Internet via our Web site. The plaza surrounding the museum is as grand as the museum itself. Two large bandstands, replicas of those that flanked the original império, stand as sentinels guarding a breathtaking reproduction of the Rosa dos Ventos. 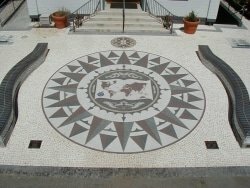 This beautiful compass, which adorns the Monument of the Discoveries in Lisbon, has been recreated in the plaza in front of the museum. Made of beautiful Portuguese tile by Portuguese craftsmen, it conveys to the visitor the majesty of the Portuguese world. Financed by individual contributors whose names are inscribed in granite on our bandstands, the plaza is the crowning glory of the museum, and is one of the great tourist attractions in all of San José. We have begun to digitize our past exhibits. In the menu above, hover over "Exhibits" and select "By Category" or "By Topic" from the drop down. The selection of exhibits will grow as we continue to digitize the past. The exhibits are best viewed with a modern browser like Chrome, Firefox, Edge, Opera or Safari.